An Ashbourne-based children’s retreat, CHICKS, is kindly supporting the Teaching School’s School Direct Initial Teacher Training programme by offering residential enrichment for trainees in February/ March 2018. CHICKS is a charity that provides residential breaks for disadvantaged children and is based at Fenny Bentley. The Daleside Retreat allows children between eight and fifteen to enjoy outdoor and indoor activities in the countryside. 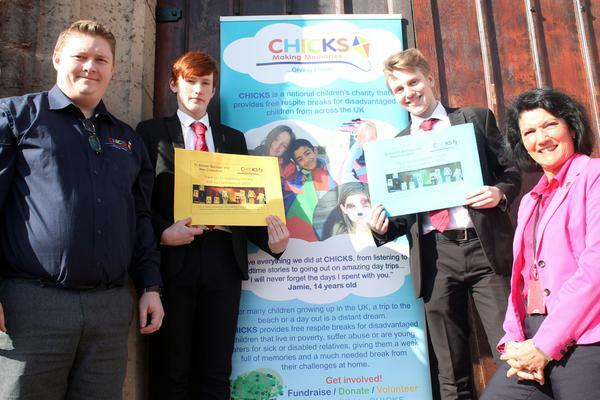 The photograph shows Matthew Nickson for CHICKS presenting a cheque to Alistair Barbour and Alex Cranstone, Year 12 students from Queen Elizabeth’s Grammar School Academy who raised funds to support the charity. Sue Farr is ADVTSA Director who has worked collaboratively with Matthew Nickson to support fund raising efforts and create a partnership with CHICKS to work collaboratively with the training of new teachers in the local area.